Twenty four years ago, I was at a small Florida outdoor art exhibit in Daytona. I came across this painting, and was really arrested by it, in a way that other modern paintings had not matched. The original was about 3 x 5 feet. The artist was friendly, and the asking price was $3,500. If I had the money, or could have borrowed it, I would have bought it. The 8×10″picture below has hung in my shop ever since. There is something captivating about it which has never faded. Above, The painting. 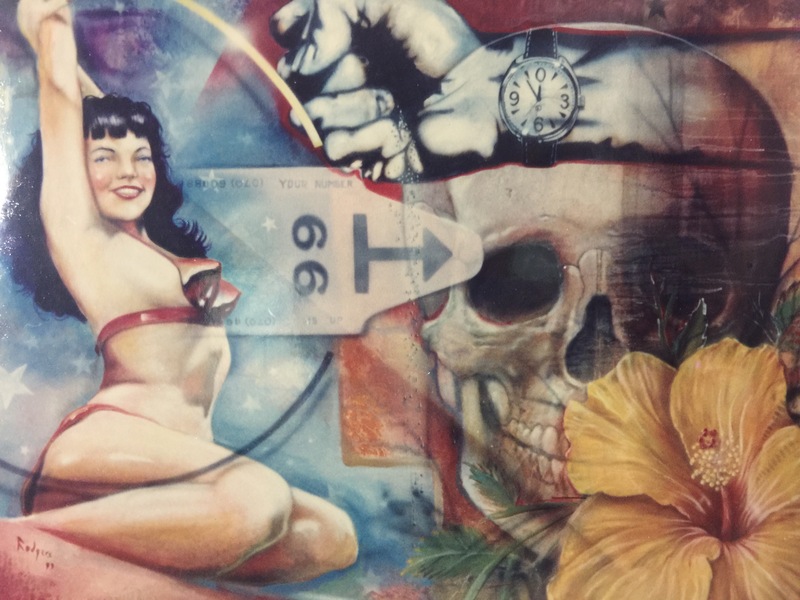 The watch shows 5 minutes to midnight, the sand is running out of the fist; Bettie Page is eternally youthful and the ticket says “Your number is up”. Most people find it disturbingly morbid, but I don’t. Ever since I was in my mid twenties, the first thought I have upon waking is a variation on this: “How did I let yesterday get away? “ Hardly any day can be passed without me asking why I didn’t get something more out of it? This is asking why I didn’t create, or read more, travel further, pick a further goal or refuse to have the same conversation again. Plenty of people are workaholics, toiling because they are afraid to stop and find out how little is there; that isn’t me, I spend a great deal of any day living in the moment, I can enjoy any hour without obsessing about other places, but when the day comes to a close, it was hardly ever enough of the important moments. The painting above expresses one of the most pervasive feelings of my life. To many airplane builders, I am a guy who is willing to share some skills they would like to learn, and that is great, it is the foundation of a very good working relationship. If none of the comments I make in the philosophy section grab them, that is perfectly fine, I trust they are not offended. For the smaller group for whom some of the stuff resonates with, good, I hope it puts a few more moments of meaning in a day that will invariably escape both of us. Kevin, Hayden is a tough act to follow, but I work at it on a percentage basis, as long as each year of my life has less charade in it than the previous one, I’m doing ok. When I look at any consumer product for sale, I ask myself “how is this going to get me any closer to a little amphibian in the Caribbean? It has to pass that test, or I don’t buy it. ww.